Notorious, the second book in the The It Girl series, is an intriguing novel by Cecily Von Ziegesar. It is about a girl named Jenny Humphrey who was easily befriended by the two most popular girls in school, Callie and Brett. Jenny lives in a dorm with Callie, Brett and Tinsley, and only Brett is nice to her. After Jenny gets suspended for an unknown reason, Tinsley is back. After a long summer, Tinsley has returned to Waverly Academy to regain her place as the “It Girl”. Tinsley walked onto the campus, expecting everyone to idolize her, but instead, she finds a curly haired brunette in her old bed. The curly haired brunette introduces herself as Jenny and Tinsley immediately dislikes her. After Callie’s boyfriend falls in love with Jenny, Tinsley tries to make things worse between the two. When Callie and Brett see Tinsley again, things between all of them are awkward. But when Tinsley steals someone special away from Brett and starts to make Callie dislike Jenny, tension starts to boil between all of them. 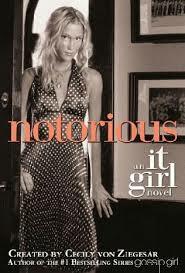 If you love the TV show and the book Gossip Girl, then you will love The It Girl series. It’s filled with drama and unexpected moments. The end is very surprising because everything is starting to fall in place for Jenny, but then it all turns around when a punishment given to two girls affects Jenny and Brett. I recommend this book to anyone who loves drama and catfights between four people who thought they were going to be best friends.